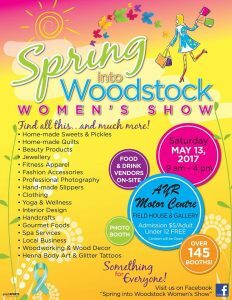 The Spring Into Woodstock Women’s Show happens Saturday, May 13th, 2017 from 9 am to 4 pm at the AYR Motor Centre (Field House and Gallery), 105 Connell Park Road, in Woodstock. Find all this…and much more! There will be Food and Drink Vendors on site, plus Photo Booth! Over 145 booths and something for everyone! Admission is $5 for adults, Children under 12 get in free. This show is open to Men and Women! Find more events like this one in the River Valley Events Calendar, and add your special event for free.